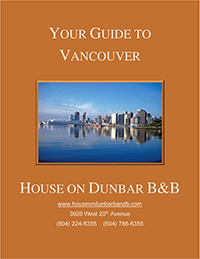 Nestled in a peaceful tree-lined neighborhood in Dunbar, Vancouver is my charming heritage home, complete with luscious green space and stylish black stucco exterior. Over the years I have updated and transformed every inch of my three-storey 1920s home into and elegant bed and breakfast retreat. My home’s West Coast Craftsman style is characteristic of the architecture in Vancouver’s west side. The design reflects the personality of the neighborhood and myself. To start the transformation from family home to elegant B&B retreat, interior walls on the main level were removed. By creating a large open space, natural light from the north, south and east windows simultaneously brightens the room. Big Italian textured floor tiles throughout main floor were also selected to both reflect light and highlight the room’s sophisticated color palette of gray, taupe, black, blue and green. Showcasing style and functionality, Italian tiles were introduced throughout my home. Simple textured cream tiles create an overall design base and complement the luxurious custom-made 3’x3′ floor mosaics. The fireplace boasts a stainless-steel surrounding with gorgeous hand-painted tiles inspired by Pollack’s painting. I love the eclectic mix of furnishings used in the formal dining room-new contemporary pieces contrast the inherited furniture enjoying a second life. The overall effect is visually appealing, blending styles and textures, from Art Nouveau-inspired glass table to luxurious leather sofas. The all new kitchen features an extra length central island, Sub Zero fridge and Wolf range. This all new contemporary design is not only visually appealing but the enhanced space and high end appliances provide great functionality in providing gourmet breakfasts for my guests. In the attic, design details and furnishings were selected to create an Old World feel. New slate tiles and elegant stripes are painted on the walls of the master bedroom and en suite. The refinished basement is more contemporary and relaxed with its stone fireplace, slate dado and columns, custom designed wood table and leather sofas. A unique marble round dining table and six low stools were imported from the Far East. The kitchen features glass tiles, which brings in more natural light. All the windows and three sliding doors are completely transparent to take advantage of the view of the backyard. The two bedrooms and their bathrooms in the basement are colour-coded to create a playful atmosphere: blue bedroom with blue bathroom, and red bedroom with red bathroom. The space is smart and inviting, comfortable even with large open-concept rooms, and is a delicious blend of natural materials and modern elements.